Secretary of State Mike Pompeo meets with Saudi Crown Prince Mohammed bin Salman, in Riyadh, Saudi Arabia, Oct. 16, 2018. 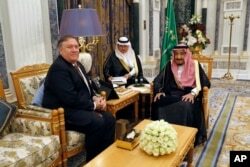 U.S. Secretary of State Mike Pompeo met with Saudi Arabia's King Salman and Crown Prince Mohammed bin Salman on Tuesday about the missing Saudi journalist last seen two weeks ago entering Riyadh's consulate in Istanbul. But there was no immediate information on the fate of Jamal Khashoggi. While Pompeo was there, President Donald Trump said on Twitter that he talked with the crown prince, the country's de facto leader, "who totally denied any knowledge of what took place in their Turkish consulate." Trump said the Saudi leader assured him that "he has already started, and will rapidly expand, a full and complete investigation into this matter. Answers will be forthcoming shortly." The U.S. State Department said that Pompeo, the country's top diplomat, made it clear to the Saudis that "learning what happened to Jamal Khashoggi is the primary reason" Trump dispatched him to Riyadh, and that the matter "is of great interest to the president." The Saudis have rejected Turkish claims that Saudi agents murdered Khashoggi inside the consulate Oct. 2, but the State Department did not say what the monarch and the heir to the throne told Pompeo in private meetings. Pompeo told the Saudi leaders of the importance of conducting "a thorough, transparent and timely investigation" and welcomed Riyadh's support for Turkish investigators in their probe, the State Department said. U.S. news reports said Saudi Arabia was edging toward acknowledging that Khashoggi was killed after he entered the consulate, blaming his death on an interrogation gone wrong. Khashoggi, a critic of the crown prince in columns written for The Washington Post, had been living in the U.S. in self-imposed exile. Pompeo's visit to Riyadh came hours after Turkish crime scene investigators finished an inspection of the Saudi consulate. The Associated Press quoted an unnamed high-level Turkish official as saying that evidence was found there of Khashoggi's killing, without elaborating, while Reuters said investigators found "strong evidence" but no conclusive proof of Khashoggi's death. U.S. Secretary of State Mike Pompeo, left, meets with Saudi Arabia's King Salman in Riyadh, Saudi Arabia, Oct. 16, 2018. Pompeo met first with King Salman, then twice with the crown prince, including over dinner. As they sat down for their first meeting, the crown prince, in English, told Pompeo, "We are strong and old allies. We face our challenges together -- the past, the day of, tomorrow." While the meetings were going on, Trump, in Washington, said on Twitter, "For the record, I have no financial interests in Saudi Arabia (or Russia, for that matter). Any suggestion that I have is just more FAKE NEWS (of which there is plenty)!" As he dispatched Pompeo to Riyadh on Monday, Trump told reporters at the White House that King Salman's denials to him about Khashoggi's fate in a phone call "could not have been stronger." 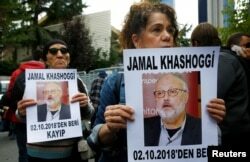 But some lawmakers in the U.S. have all but accepted Turkey's version of the events, that a team of Saudi agents arrived in Istanbul and killed Khashoggi when he went to the consulate to pick up documents he needed to marry his fiancee, Hatice Cengiz, a Turkish national who waited in vain for Khashoggi to emerge from the consulate. Republican Sen. Lindsey Graham said Tuesday the U.S. should "sanction the hell out of Saudi Arabia" over the incident and said he would never again work with the crown prince, assailing him as "toxic" and calling him a "wrecking ball." Pompeo briefed Trump and National Security Advisor John Bolton about his talks. Up until this point, Saudi officials have strongly denied accusations that Khashoggi was murdered, saying instead he left the diplomatic outpost on his own. Neither side has publicly shown clear evidence to back up its claims, and the two governments agreed on a joint working group to probe Khashoggi's disappearance. President Trump said King Salman told him in a telephone call Monday that he had no knowledge of what happened to Khashoggi. "Maybe I do not want to get into his mind, but it sounded to me like maybe these could have been rogue killers - I mean, who knows?" Trump said. David Mack, a scholar at the Middle East Institute and a former ambassador, told VOA that what Saudi Arabia is accused of would be hard to get away with in the United States, but is possible for Saudi Arabia given its tight controls on the media and discipline instituted by the royal family. "I suppose possible that Saudi Arabia will be able to sell this, however I think most people would be very dubious that Crown Prince Mohammed bin Salman had not had some hand in the matter or knowledge that it was taking place," Mack said. Trump told the CBS news show 60 Minutes on Sunday that Saudi Arabia would face "severe punishment" if it is determined Khashoggi was killed inside the Saudi consulate, but Riyadh dismissed the U.S. threat and said it would retaliate if Trump took any action against Saudi Arabia. In protest of Khashoggi's disappearance, several U.S. businesses leaders have pulled out of next week's Future Investment Initiative in Riyadh, dubbed "Davos in the Desert," after the annual meeting of world economic interests in Switzerland.